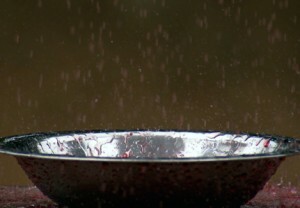 When red rain fell over southern India in 2001 radical theories concluded that the red particles in the rain could be alien microbes. After intense analysis at two labs in the UK, Astronomer Chandra Wickramasinghe who studied the cells with microbiologists at Cardiff University says that “As the days pass, I’m getting more and more convinced that these are exceedingly unusual biological cells.” The “Red Rain” cells of 2001 multiply under extreme heat and were found not to contain DNA. This September 2010, after a further four years of studying the cells, Lewis was joined by a leading panspermia theorist from the UK, Chandra Wickramasinghe, publishing their claims that the red rain cells are unlike anything found on Earth, which inert at room temperature – begin to reproduce at 121C. Within two hours of being exposed to the heat, “daughter cells appear within the original mother cells and the number of cells in the samples increases with length of exposure”, they say in the new report. Many spores on Earth can survive extreme heat, but none have yet been discovered that can reproduce in those conditions, much less require it to begin reproducing. The team also found an unusual pattern in the way the cells changed colour under UV light, known as “fluorescence behaviour”. Like a report out of “X Files,” they said it was “in remarkable correspondence” with red emissions from the Red Rectangle planetary nebula some 2300 light years away, “suggesting, though not proving, an extraterrestrial origin”. “As a biologist, let me assure you that a cell-sized and shaped organism that reproduces, lives off LB and doesn’t appear to have any nucleic acid template (DNA or RNA) is a revolutionary discovery in and of itself,” according to a commentor at MIT’s TechnologyReview.